Delays in the debut of SpaceX’s huge Falcon Heavy rocket have prompted ViaSat to move the launch of a high-speed Internet communications satellite from the new privately-developed booster to an Ariane 5 flight in early 2017, officials said last week. The ViaSat 2 communications satellite, now in the final stages of assembly and testing at a Boeing facility in Southern California, will double the bandwidth of ViaSat’s current flagship spacecraft, which offers high-speed Internet services across the United States. ViaSat announced in early 2015 that the ViaSat 2 satellite, expected to weigh more than 14,000 pounds (6.4 metric tons) at liftoff, would launch aboard a Falcon Heavy rocket from Cape Canaveral in late summer 2016. But the Falcon Heavy’s development has run into delays, eroding ViaSat’s confidence that the new rocket will be ready to launch ViaSat 2 by the end of the year. “While we still have great confidence in SpaceX, it’s clear that a few recent challenges are stressing the Falcon Heavy manifest,” said Mark Dankberg, chairman and CEO of ViaSat, based in Carlsbad, California, during a Feb. 9 conference call with investment analysts. The Falcon Heavy is formed by connecting three Falcon 9 rocket first stage boosters in a triple-body configuration, giving the rocket three times the Falcon 9’s liftoff thrust to haul heavier cargo into orbit. With 27 engines firing at liftoff — collectively generating more than 4.5 million pounds of thrust — the Falcon Heavy will be the most powerful rocket in the world when it flies from Kennedy Space Center’s launch pad 39A, the space shuttle’s old launch facility. 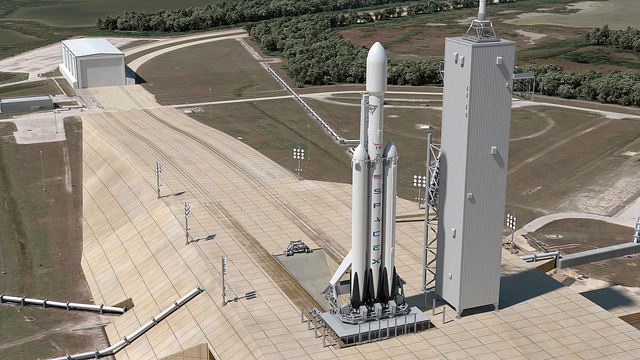 But the Falcon Heavy’s first launch has repeatedly been rescheduled from its original projected flight date in 2013. SpaceX founder and chief executive Elon Musk told an audience Jan. 30 at Texas A&M University that the Falcon Heavy’s first test flight would occur toward the end of the year, perhaps in late September. That is a few months later than his prediction last year of an inaugural flight by April, when Musk said work on the Falcon Heavy slowed to allow SpaceX engineers to focus on other pressing projects. Dankberg said switching ViaSat 2’s launch from SpaceX to Arianespace will help ensure the satellite is operational next year. ViaSat 2 — heading for geostationary orbit — is too heavy to launch aboard SpaceX’s Falcon 9 rocket. “The transition of the ViaSat 2 launch to Arianespace builds confidence in the launch schedule to meet ViaSat’s goals of bringing new high-speed service plans across North and Central America, the Caribbean and the North Atlantic Ocean by the middle of calendar year 2017,” Dankberg said in a statement. ViaSat 2 is key to the company’s strategy to offer higher-speed Internet connectivity to airline passengers, maritime travelers, government users and the oil and gas industry. The new satellite covers seven times the geographic area as ViaSat 1, which launched in 2011, and offers service at lower cost, according to ViaSat. ViaSat touts the affordability and bandwidth of its services, which include the introduction of streaming movies to Virgin America and JetBlue passengers via Netflix and Amazon Prime, respectively. In its quarterly earnings call Feb. 9, ViaSat also revealed the architecture of a third-generation network called ViaSat 3 to take the company’s broadband network global. Consisting of three Boeing-built satellites, the ViaSat 3 program is a five-year, $1.4 billion investment. ViaSat said it has designated one of the ViaSat 3 satellites to launch on a SpaceX Falcon Heavy rocket, and another to fly aboard an Ariane 5. 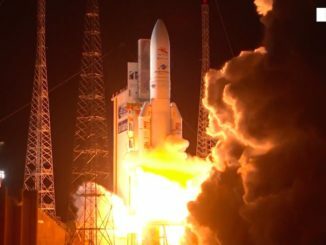 The ViaSat 2 and ViaSat 3 satellites will fly in the upper position on the Ariane 5 rocket, which typically hauls two telecom spacecraft into orbit at a time. The upper position houses the larger of the two payloads on each mission. 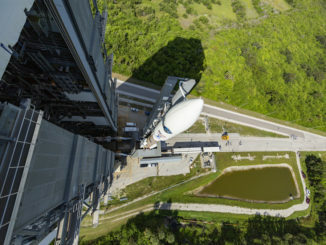 The swap from the Falcon Heavy to the Ariane 5 rocket, which sells at a higher price, will have little impact on the ViaSat 2 program’s expected cost of around $650 million, said Richard Baldridge, ViaSat’s president and chief operating officer. “I think Ariane had a hole in their manifest, and we were able to grab it, and so we think we got a good price,” Baldridge said. 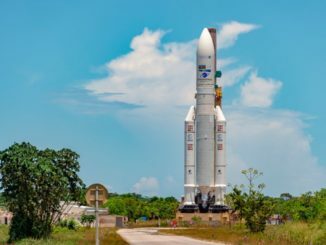 The lower insurance premium for the workhorse Ariane 5 rocket should also offset any extra costs, he said. ViaSat 2 was third or fourth in line in the Falcon Heavy’s manifest, after an initial shakedown flight without a customer’s payload on-board and a U.S. Air Force mission penciled in for the Falcon Heavy’s second launch. The fourth satellite for Inmarsat’s Global Xpress broadband network is still booked for a Falcon Heavy flight, although Inmarsat officials have said they would make a final decision on whether to launch the spacecraft — which is considered a spare — early this year. Other payloads with firm Falcon Heavy reservations include the EuropaSat/Hellas-sat 3 television broadcasting satellite, a joint project between London-based Inmarsat and Greece’s Hellas-sat, and the Arabsat 6A signals relay platform. The ViaSat 3 launch agreement with SpaceX keeps the Falcon Heavy backlog steady after the loss of the ViaSat 2 mission to Arianespace. Each ViaSat 3 satellite will provide a terabit per second of network capacity, equivalent to all commercial satellites currently in space, the company said in a statement. ViaSat aims to tap markets in in-flight connectivity — for passenger entertainment and cockpit avionics — residential Internet access, the oil and gas community, secure government operations, and conventional cellular and wifi networks. The first ViaSat 3 satellite will launch in 2019 with a coverage zone over the Americas, followed by a second craft in 2020 for European, African and Middle Eastern markets. A third satellite for the Asia-Pacific would come next. Development of the first two ViaSat 3 satellites is already underway, officials said.